With successful years of bringing high quality garden furniture, Unopiù is proud to present its line of garden table designs which are made from diverse materials such as wood and metal. These garden tables are not to be easily dismissed as simply pieces of furniture to hold meals for dining. They are carefully thought out, designed and created into interesting choices that create a fascinating focus point for every outdoor living space. Wooden garden tables made by Unopiù are built from the best quality solid teak to ensure durability, longevity as well as beauty. Various styles, colors, heights and shapes make up the prestigious line of Unopiù’s wooden tables. However, metal garden tables in varying designs are likewise available to give a touch of modernity and sophistication. They can be used as balcony table, patio table or for any outdoor dining or reception area. Whether they are round garden tables made of metal or teak garden tables of another style, these furniture designs are simply amazing works of art. They can be easily used to set the tone for the entire space and can easily promote a smooth flow of conversation during gatherings. Some products are foldable which makes them convenient to store when not in use. On the other hand, the rich finishes of teak garden tables help to create a luxurious extension of the indoors. 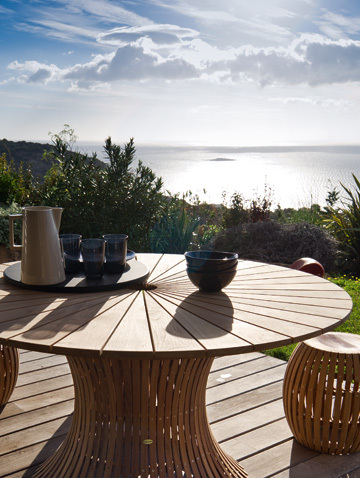 All of Unopiù’s outdoor wooden tables are skillfully made by master crafters in Italy. This means that the quality is never compromised. With the different styles and designs available in wood, any homeowner can easily personalize the outdoor area to suit the kind of ambience imagined. These tables are normally made of solid wood; therefore, they are durable, long-lasting and are easy to maintain. While wooden tables are some of the more popular choices, other products that are highly popular are metal outdoor tables which tend to give a tone of modernity to any outdoor dining space. Popular products range from dining tables, coffee tables and even foldable ones. Some are also perfect for holding decorative items such as flower pots. These are luxury garden tables that are very convenient, sturdy and stylish.